No risk of unwanted release. Simply press the handles to release the crown. Different tips allow you to grip all kind of shapes or surfaces. This device is fully autoclavable. Geko Tweezers are self-locking, fully autoclavable, cross-tweezers that are designed to safely hold small objects in place during dental procedures. They allow the user to grasp and safely handle crowns, posts, abutments, and implants. They grip and clamp the crown, for example, in place during the entire procedure but require minimal effort to release the pressure on the crown or other object. The adjustable micrometric screw can be placed on either side of the instrument depending on whether the user is left- or right-handed. The user can avoid over-tightening or slipping of the object by adjusting the micrometric screw to reach optimal pressure. Silicone tips fit on the end of the tweezers and are autoclavable. Geko Paste is used for hard-to-grasp objects, such as inlays, veneers or onlays. The kit contains one Geko Tweezers, 20 silicone tips, a 5-mL syringe of Geko Paste, and manufacturer's instructions/product literature. Geko Tweezers were evaluated by 26 consultants in 478 uses. They received an 84% clinical rating. 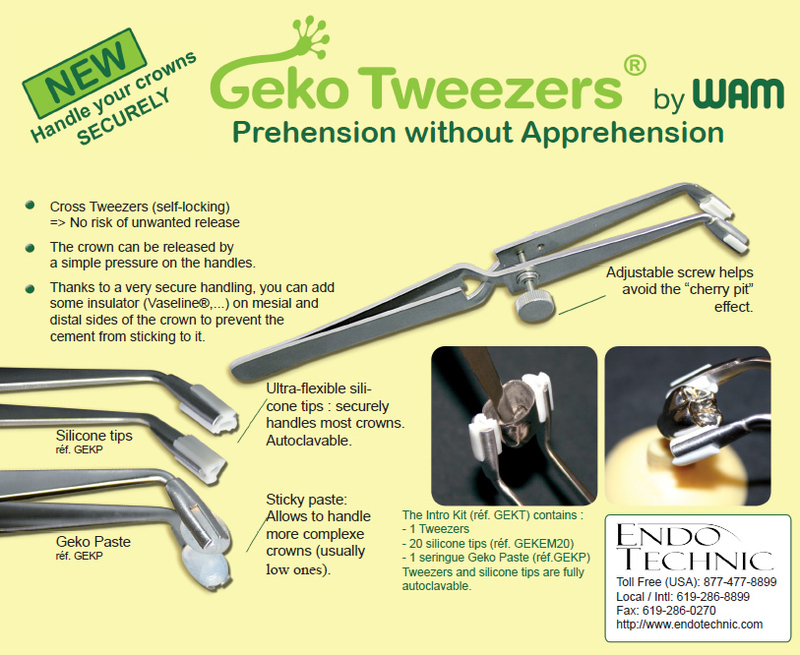 Consultants liked the ability of Geko Tweezers to hold small objects and reach into the posterior area of the mouth. Many consultants commented on the usefulness of Geko Paste and its ability to hold an object, yet release cleanly when desired. The advantage of these locking tweezers is that they avoid excess pressure on the object being held, but the thumbscrew can be cumbersome. For inlays and onlays, the Gecko Paste was especially useful for holding the restoration, but avoid getting any Geko Paste on the internal surface. Fifty percent of consultants reported that Geko Tweezers were better than their current delivery system and 12% reported that they were equivalent. Thirty-eight percent would switch to Geko Tweezers and 50% would recommend them. > Place Geko Paste on the tweezer tip holding a flat surface of the restoration and use a silicone tip on the other side of the tweezers. > Be careful during try-in or cementation to make sure the restoration is firmly on the tooth before removing Geko Tweezers. > Check the orientation of the crown on the tweezers to the desired tooth before loading it with cement for proper positioning. > “I liked the ability to hold very small objects.